Dave Fulton - Oberheim Expander, Korg MS-20, Wavestation, Prophet VS, Moog Source, Roland SVC-350 Vocoder, Emulator II & III, Akai S5000, Kawai K5000, Waldorf Microwave II, Microwave IIXT, Nordlead, Oberserge Expander, Serge Modular, ASM-1 Modular, Doepfer Modular, Nord Modular I have eagerly been waiting for the official release of this CD, as I've owned a CD-R of it for some time, and have been wanting to extol its virtues ever since. Dave Fulton is half of the band Dweller at the Threshold (D@T), makers of a creative blend of ambience and electronics, with just a dash of progressive rock. 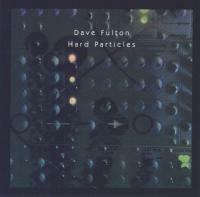 Dave is the more ambient of the two creative forces, as is evident on "Hard Particles," a wonderful excursion into a very visual sci-fi music experience. This CD is a stunner, sneaking up on the listener by surprise. Starting unobtrusively with "Neutrons at Thought Pressure" (great title! ), this runs directly into the bubbly, effusive "Small Particles." The bubbling, pulsing sound is layered with long synth sweeps that float throughout much of "Hard Particles." If this doesn't pique your interest, then the rush of energy from the title track almost certainly will. Inconspicuously sandwiched in the very middle of the CD, "Hard Particles" is a terrific song. From the opening pulse, you can tell it is time to brace for a great ride. Something like NASA sound samples joins the pulse. Some bass jumps in, moving swiftly from right to left. Strong lead lines assert themselves midway through, scintillating synthesizer sounds that you can sink your teeth into. Then, almost as soon as it begins, it all tapers back off into the deep echoes of outer space. Besides the quality of the music itself, "Hard Particles" is one of the best CDs I've heard when it comes to the order of the tracks. Songs are carefully placed for maximum effect. For example, the driving energy of the title track is offset by "Leak," a brief, almost pretty piece of ambience and bell-like tones, which then makes a nice transition to the deeper synth tones and washes of "Clouded Flats of Radiation." Though the CD has a very cohesive musical identity, there are some interesting variances. "Random Images" has some fascinating sounds, reminding me of Hypnos artist Saul Stokes (like Saul, Dave makes some of his own components). "Particle Reversal" has elements more familiar to D@T fans. Still, the music very successfully keeps within a certain vein. Beautifully packaged, both inside and out, "Hard Particles" is a winner. 1999. Phil Derby Dave Fulton is a member of Dweller At The Threshold so you can understand in which direction his solo-cd goes, namely in that of vintage electronic music. I must say I find the music of Dweller… less vintage than that of most of their collegues and Fulton's music again less vintage than that of Dweller… so that is interesting. The cd contains music he recorded in the period 1992-1999 with an amount of equipment to lick your fingers off. Most of the tracks are quite atmospheric and rustic. Sometimes I even hear a distant comparison with the quieter pieces of Ron Boots like in the fine tracks "Small Particles" and "Random Images". A very nice listening-experience.